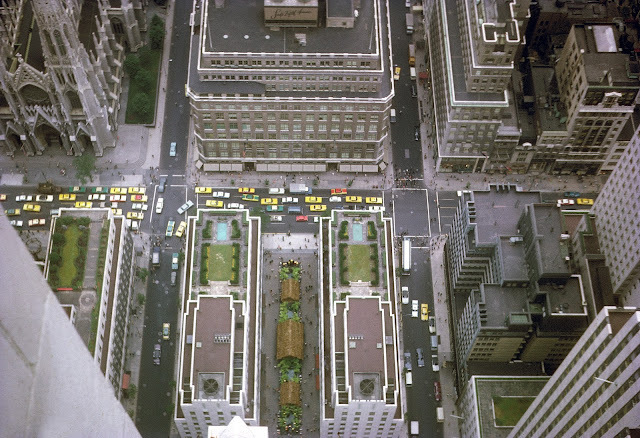 In the old days you used to be able to walk out onto these roof gardens as part of the tour of Rock Center - at least I assume so since I have a photo from this set of Mrs PND senior standing on the grass down there. Now you can get something of a view of them if you go to the top floor of SAKs which I did a few years ago but I would like to go out to one of these gardens just once. I've guessed that this image was taken mid morning on a weekday and, assuming that, it is interesting to see how much less traffic there is both on the roads and on the sidewalks. Check out my book on Blurb in print and iPad versions. If you want to make your own here's a link for $20 off your first book.